A good stretch of the Outer Banks is protected as a National Seashore, but there are also some developed spots with low-rise hotels and cottages. It was awesome to stay facing directly onto the ocean like this, but I would 100% not want to be here during a hurricane – barrier islands are important landforms that help absorb the energy during hurricanes and protect the mainland. I wonder what the long-term stability of the shorefront is in a place like this. Also, driving on the beach! No!!! Driving along the National Seashore stretch from Kill Devil Hills (about a 2 hour drive) really emphasized just how skinny and precarious these barrier islands are. It’s cool but also a bit unsettling to look out either side of the car and see a bit of sand and then the ocean. To step out of the car and walk to the beach would take no more than 3 minutes for a lot of that drive. 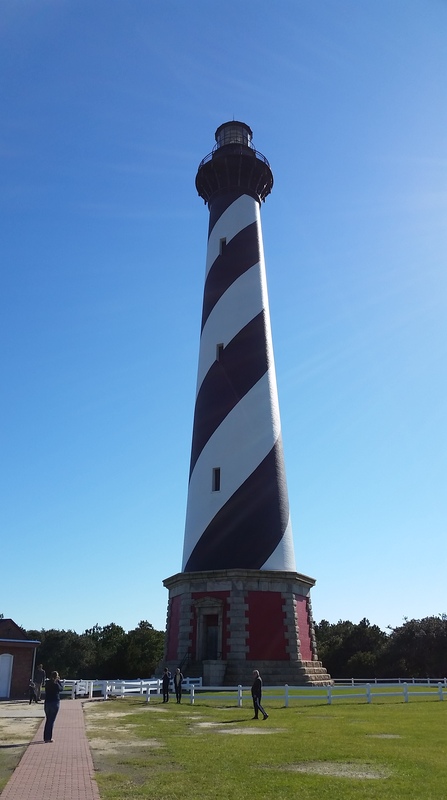 The Outer Banks have a number of famous old lighthouses and as a proper Maritimer I would have been remiss in not visiting at least one, so we took a gander at the biggest and most famous one, the Cape Hatteras lighthouse. It was definitely a lighthouse. Also of historical note in this region is that this is the area where the Wright Brothers flew the first airplane! 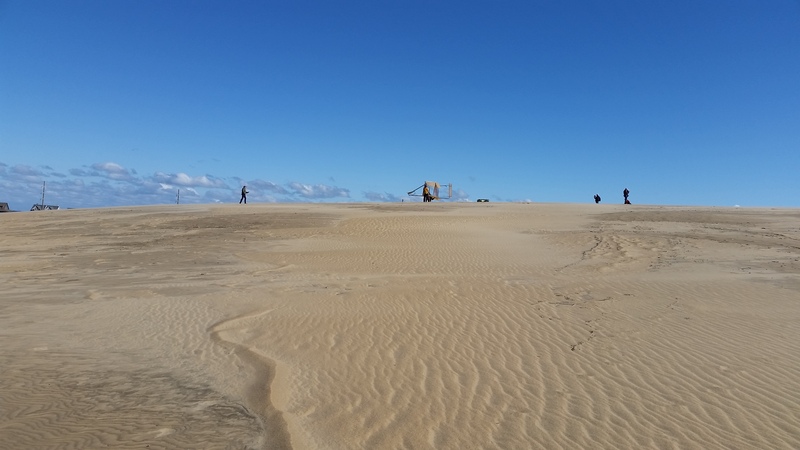 The sand dunes in the area around Kitty Hawk were perfect for trying out gliders with the ability to crashland with at least a slightly soft substrate. I took this photo of a recreated Wright Brothers aircraft being taken out for a spin at Joffrey Ridge State Park, home to the tallest sand dunes on the East Coast. lthough I grew up on the ocean, Nova Scotia is far enough north of North Carolina that the birds and invertebrates are pretty different between the two places, despite being on the Atlantic coast. 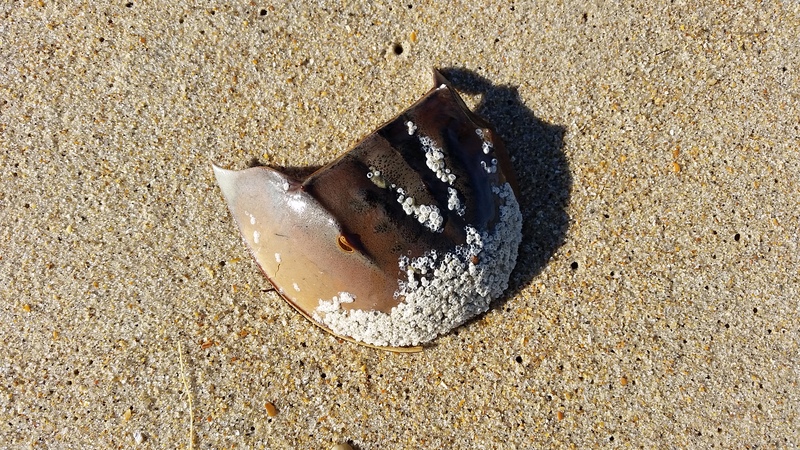 I was particularly excited to spot several moulted bits of horseshoe crabs, an animal I would dearly love to see alive in the wild sometime, maybe even during their crazy mass spawning events. It’s really hard not to feel a connection to the past when you spot a horseshoe crab – it feels like a trilobite should be scuttling around right behind it. I also enjoyed hanging out with some very fine Brown pelicans (Pelecanus occidentalis). And also had a lot of fun watching the various shorebirds having a go of things in the intertidal zone. This is a willet (Tringa semipalmata). Being a willet looks hard. With that we conclude our digital foray across North Carolina, and I also conclude my postdoc at the North Carolina Museum of Natural Sciences! In two days I fly back to Canada and begin the process of shuffling from Alberta to Ontario. I’ll be starting a new postdoctoral position in David Evans‘ lab at the Royal Ontario Museum this September – I’m going to miss North Carolina and the Zanno Lab terribly, but here’s to new adventures! See you soon!